LEN - www.lankaenews.com | Can you beat that ! 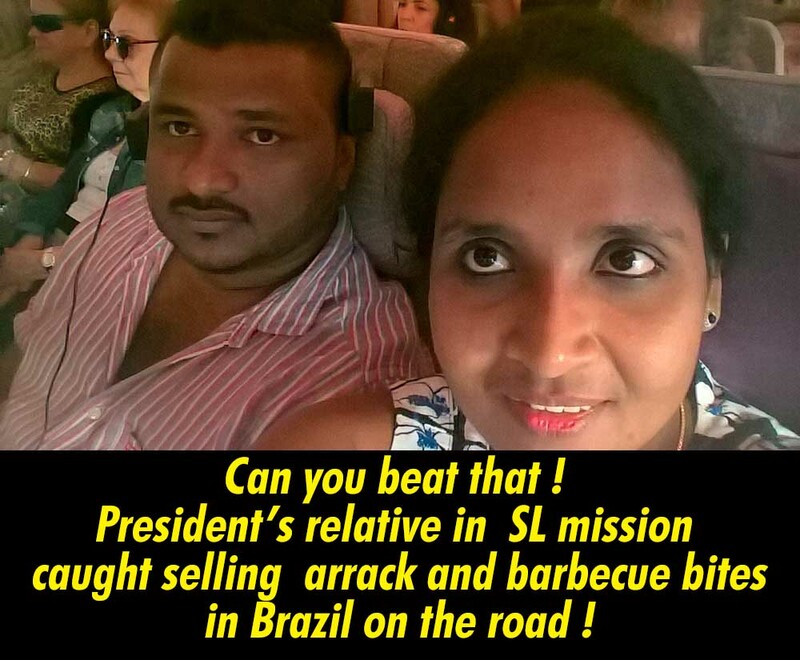 President’s relative in SL mission caught selling arrack and barbecue bites in Brazil on the road ! (Lanka e News 14.Aug.2018, 11.45PM) Will you believe if we reveal that another Sirisena , that is a relative of president Maithripala Sirisena bearing president’s name was caught red handed when selling illicit arrack and bites on the roadside while performing duties in the Sri Lankan (SL) mission in a foreign country ? You may say it is incredible but we say it is true and deserves a place in the Guinness book of world’s most ignominious records . Shockingly , this disgraceful world record breaking ‘feat’ was performed by none other than a relative of president Pallewatte Gamaralalage Maithripala Sirisena . The name of this ‘great achiever’ is also a Sirisena - Yapa Pathirage Nalin Nishantha Sirisena to be precise . When making selections for foreign diplomatic missions , president Sirisena who had become most famous for selecting the worst misfits and discards for important posts had created vacancies in the SL embassy in Brazil even when there were no such vacancies , and sent Nalin Sirisena and his wife Hansani Jayasekera there about 4 months ago. Hansani’s post was assistant attaché , a strange one at that and her duties presently are aimlessly loitering within the embassy and assisting the accountant . Like the other embassy officers , this couple too is provided with all the perks and privileges including a Bungalow which is located at SQS 109, Bloco C -AsaSul ,Brasilia Brazil -Apartamento 512. While the couple is staying there and undergoing job training , the duo have become notorious for always intimidating and frightening the other officers while basking in the relationship they claim they have with president Gamarala. Nishantha Sirisena has been bragging he was with the Interpol in SL , and that during his holidays he is comming to Brazil . The duo incessantly boast, because they are relatives of president and have Interpol links , there is nothing they cannot do. Wife has no fixed duty time of arrival or departure .Though she leave office at 2.00 p.m. she mark time of departure from office as 5.30 p.m. Bragging about their ties with the president and exploiting his name, the couple throws their weight about , whereby they have become a most detested couple who gets involved in conflicts endlessly and constantly with the other staff within the embassy. Nishantha Sirisena is therefore having various disputes not only with the embassy staff but even with the Sri Lankan community in Brazil who had been there for 10 to 15 years. About 4 months after this couple arrived in Brazil , they have commenced the new business. That is right in front of their ‘apartment’ aforementioned - they have started barbecue sales by the side of the main road. There are 140 diplomatic missions in Brazil . Though Sirisena couple is engaging in this wayside sale of barbecues , not a single officer of any other mission is engaged in any business , let alone barbecue sales. This is because those are legally barred. Yet , Nishantha Sirisena the relative of president Sirisena ignoring all these had after beginning his barbecue business developed it too to include sale of gal arrack along with barbecue bite portions. This untoward business of president Sirisena’s brother Nishantha Sirisena however flourished but not before tarnishing the image of the country whose president is his own relative . That is , Nishantha disgraced his own president his relative . Whether the latter is also nevertheless enjoying the ‘fun’ is unknown. May be this barbecue sale on the road is an ‘ability’ Nishantha had acquired through the genes because president Sirisena ‘ s grandfather Albert Sirisena who migrated from Gampaha Oruthota to Polonnaruwa Laksha Uyana was also most successful in selling kasippu (illicit liquor) during his period. Albert Sirisena who on his own accepted the rations given by the government then for distribution among those who emigrated , while distributing them also distributed kasippu riding his bicycle . If not for that inherited trait from his forefathers in Nishantha Sirisena , he would never ever think of selling ‘gal’ arrack and barbecue bites on the main road after going to work in a prestigious Sri Lankan foreign diplomatic mission . While this activity was on going , Nishantha got involved in a brawl at a sleazy ‘joint’ and was at the receiving end of a fierce pummeling in Brazil . The low class of Brazil’s society needs no elaboration , and it did not take much time for the news to spread like wild fire. . Through another diplomatic mission , the crazy ‘adventures’ of the officer in the SL embassy in Brazil spread like wild fire with spice and flavor added to it. When this news reached the SL foreign mission in Brazil , the first secretary summoned Nishantha and ordered him to immediately halt his illicit liquor and barbecue bite business. Following the warning of the first secretary and the earlier brawl he was involved , the business has been temporarily halted . Sadly however , the country’s image has already been damaged by this shameless scoundrel . Yet to the dismay of all no punishment has been meted out to this Illicit liquor and barbecue bite businessman Nishantha Sirisena who disrespectfully stooped to the lowliest level despite the fact he is there to work for a most respectable diplomatic service. Although Colombo has been informed in this regard , because president Sirisena is giving protection to the illicit arrack business couple , the latter is free and enjoying themselves to the hilt. In the photograph is president Sirisena’s relative Nishantha Sirisena and Hansani Jayasekera who broke world’ s most ignominious record by selling illicit arrack along with barbecue bites on the main road while working for the foreign diplomatic service.